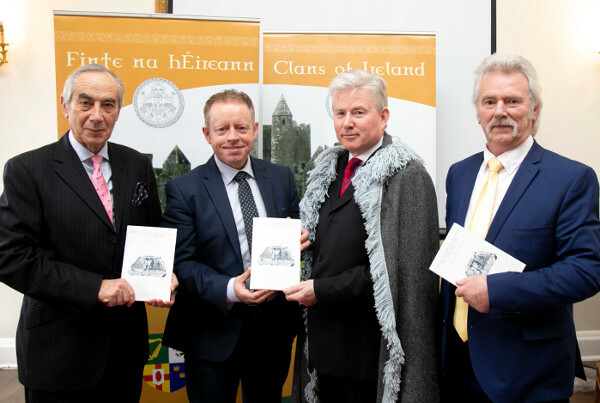 Pictured at the launch of Politics, kinship and culture in Gaelic Ireland, c.1100–c.1690 were (L-R) Conor, The O'Brien, Minister Ciarán Cannon TD, An tUasal Gearóid Ó Ceallaigh and Dr Joseph Mannion. A wide-ranging and informative anthology of essays dealing with the history and culture of Gaelic Ireland was officially launched by Ciarán Cannon TD, Minister for the Diaspora and International Development, during the Clans of Ireland 2018 Annual Conference in The Stephen’s Green Hibernian Club, Dublin on Saturday 14 April. Entitled Politics, kinship and culture in Gaelic Ireland, c.1100–c.1690, this much-anticipated publication was co-edited by Dr Joseph Mannion and Dr Katharine Simms. The book comprises sixteen papers emanating from an annual essay competition on Gaelic Ireland, jointly sponsored by The Standing Council of Irish Chiefs and Chieftains and Clans of Ireland, in conjunction with the History Department of Trinity College Dublin and History Ireland magazine. The works represent the winning entries and superior quality essays from 2013 to 2016, and cover the period from the twelfth to the seventeenth centuries. The study themes vary from political and social history to kinship and culture, relating to a selection of Gaelic Irish, Anglo-Norman and Scottish population groups who shared the island. This is the second volume in the series, the first being Gaelic Ireland (c.600-c.1700): politics, culture and landscapes, which was edited by Katharine Simms and published in 2013. It was the product of a competition initiated by The Standing Council of Irish Chiefs and Chieftains, with the object of encouraging research into Gaelic Ireland among postgraduate historians and independent researchers. In 2013, Clans of Ireland became involved in the project, and has since then actively promoted and jointly sponsored the annual essay competition, leading to the publication of this second anthology. For a list of contents and a facility to purchase the book, see https://wordwellbooks.com/book-catalogue/History?product_id=1836.